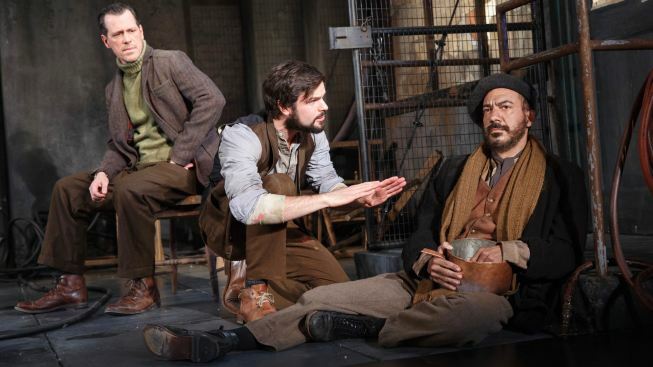 Darren Pettie as Leduc, Jonny Orsini as Lebeau and Evan Zes as an unnamed gypsy in Arthur Miller's "Incident at Vichy." Below, Richard Thomas, as Von Berg, is a member of the European aristocracy—not a Jew—who makes a fateful decision about his responsibilities to humanity. In France, men are being held against their will by a group that wants to establish its own idea of a new world order, with itself at the top. The violent interlopers will first cow, and then annihilate anyone who doesn’t fit their criteria. As the one-act drama gets under way, 10 men have been pulled off the street for a racial “inspection.” It’s 1942, and rumors of camps and cattle cars circulate. The men vary in age and profession, but are all unfortunate equals in a makeshift waiting room, where a Nazi academic (Brian Cross) will call them, one at a time, and check to see if they have been circumcised. The men begin to assess their circumstances, but won’t use the word “Jewish” for fear of self-incrimination: “Listen, you’re Peruvian, aren’t you?” asks Labeau (Jonny Orsini, of “The Nance”), a nervous painter who, like the rest, was arrested after police made an inference based on measurements that included estimating the size of his nose. A striking element of this “Vichy” revival, coolly directed by Michael Wilson (“The Trip to Bountiful”), is that few of the men look stereotypically Jewish -- aside from one, whom Miller identifies only as the “Old Jew” (Jonathan Hadary, the “Gypsy” Tony nominee). There’s something chilling merely in the variety of the casting. Miller’s detainees represent a spectrum of philosophical positions. There’s a naive actor (Derek Smith), who is sure this will all work out fine; an anxious teenage boy (Jonathan Gordon), terrified, but wise beyond his years; and a psychoanalyst (Darren Pettie), who is first to recognize the situation’s severity. Sitting quietly through much of the drama is an Austrian aristocrat (Richard Thomas), who was mistakenly arrested. Thomas’s Baron Von Berg is the everyman who knows great wrongs are happening, but believes there’s nothing he can do about it. His complement in this room is James Carpinello, as a German major perpetrating offenses under orders -- but so conflicted about it that he’s nearly suicidal. If it’s the well-spoken Pettie who explains why we’re here, it’s Thomas and Carpinello whose performances force “Vichy” into more active territory. “Vichy” comes down to the baron and major in a faceoff. Before us are one man who has been passive, and another who has disassociated himself from his crimes. Is one more guilty than the other? Don't they both have a responsibility to act? As soon as we understand there's a question being posed, the stage goes dark. That's silence, speaking louder than words. “Incident at Vichy,” through Dec. 20 at The Pershing Square Signature Center. Tickets: $25-$75. Call 212-244-7529.
Review: Takei's Debut in Stirring "Allegiance"